Given the increased concern over air pollution & petroleum supplies, the electrification of the automobile is well under way and accelerating every day. The development of electric and hybrid electric (EV/HEV) vehicles is triggered by majority of automakers to maintain their competitive position in the rapidly changing environment. The EV/HEV initiatives are facing lots of design challenges because of increasing dependency on electrical components and overall complexity, coupled with short design cycles. Also the automotive R&D department have to work on hundreds of thousands of design alternatives for addressing structural and thermal considerations along with electromagnetic design constraints. Simulation technology answers all the above requirements and act as a key differentiator in the electrification competition of the powertrain technology. DEP offers a wide range of simulation solutions for complex EV/HEV powertrain design that has significant impact on performance & efficiency. Calculate induced voltage, load torque, cogging torque, inductance, flux linkage, losses (iron, copper, and magnet), parameter sensitivity, equivalent circuit model extraction, heat generation, temperature distribution, stress, vibrations, radiated sound, magnetization, demagnetization, and skew effects. 1. 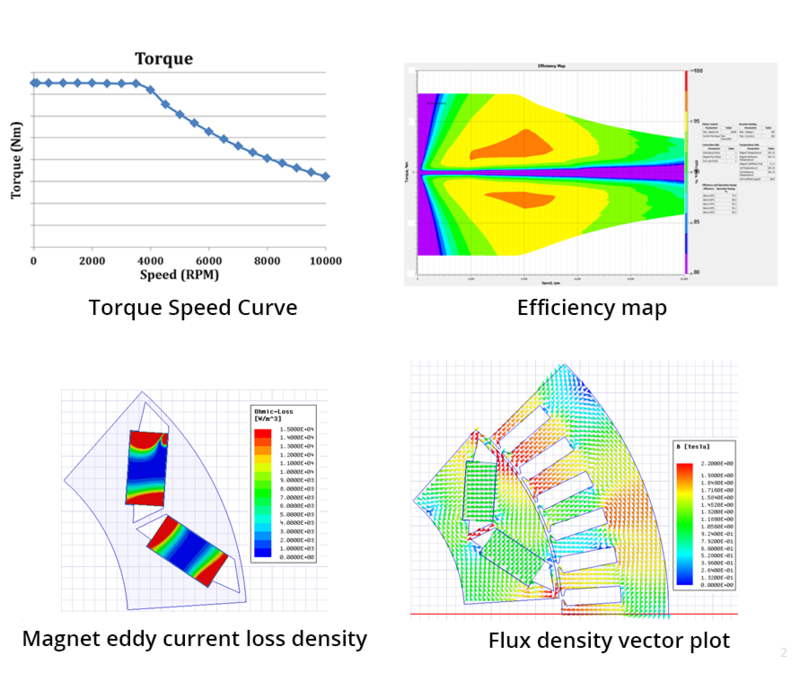 EV/HEV Traction Motor Simulation – Motor represents a major cost and most automotive OEMs invested heavily in developing their own motor hardware. But EV becoming the future of transportation, a change of course is required in the designing process which starts all the way from scratch for the development of motor/generator. From the performance measure perspective, power capabilities and efficiency of the electric motors play a vital role in making the auto brands outshine competitors. 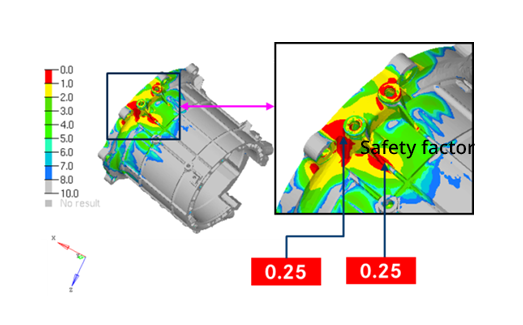 DEP’s traction motor simulation is a perfect solution for today’s automotive engineers whose optimization needs include efficiency, size & cost along with NVH, Reliability & Durability. 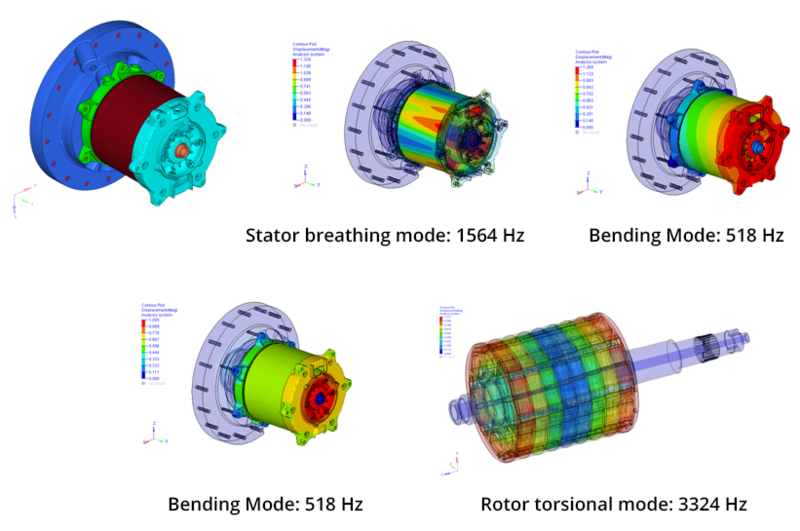 Our FEA (finite element analysis) of the motor/generator, makes it possible to develop and optimize traction motor design performance in a shortened development time. With our accumulated knowledge and experience in motor design, the various mechanical, fluid dynamics, thermal, electrical and electromagnetic requirements are fulfilled up to the expectations. 2. Coupled Control/Circuit Simulations – Building hardware is a great art that requires time and lot of procedures & guidelines. But evaluating the machine model by connecting them to circuit model is the new extraordinary experience that DEP can provide. The circuit simulation process is an invaluable analysis tool that can replicate the behaviour of the actual device and in turn helping us to find the design efficiency long before the prototyping stage. The analyses are performed by linking to power electronic simulators such as Simplorer and MATLAB/Simulink. The coupled simulation technique is developed based on the finite element method. 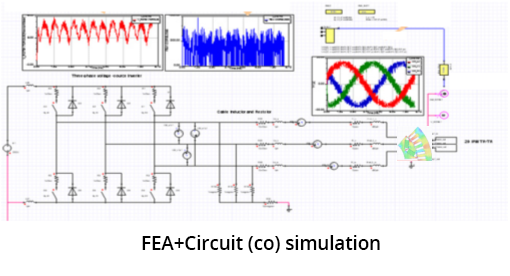 The circuit simulation is mainly devised for improving design capability and efficiency. The coupled simulation results are demonstrated and then enhancements are proposed according to the outputs. 1. Motor Thermal Analysis – Temperature is an important factor that affects the performance of electric machines. 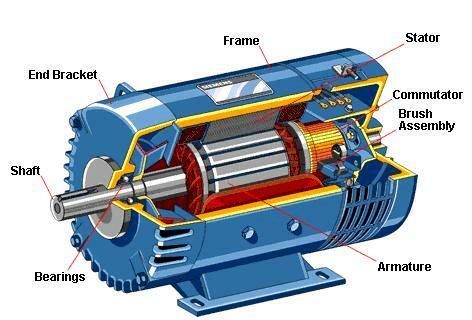 Thermal design of electric machines makes them prone to problems such as insulation breakdown, reduction in torque provided, shortened lifetimes and so on. In order to develop smaller and more efficient electric motors, there is a necessity to carry out more thermal analysis in parallel with the traditional electromagnetic design. Thermal analysis of electric motors is in general regarded as a more challenging area of analysis than electromagnetic analysis in terms of the ease of constructing a model and achieving good accuracy. Designing of motors need simulation tools that can be employed for quick, accurate product development. By employing computational fluid dynamics (CFD) in the motor design, they can accelerate the development and achieve better motor cooling and higher efficiencies. Conjugate heat transfer (CHT) analysis on motor will help in understanding the heat loss to components, coolant and atmosphere. 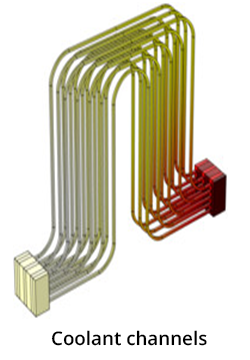 Optimized flow path can be designed based on the CFD results, which helps in improving life of the motor. 2. Inverter Thermal Analysis – The reliability & durability of power electronic devices is uncontroversially depend on operating temperature, which is related to loads and ambient conditions. 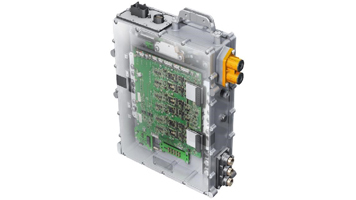 Inverters, which control motors, must have sufficiently high power densities. Inverters may operate at a wide range of temperatures. Because the heat generated from inverters differ depending on the inverter materials and the cooling structure. Alongside motors heat analysis are carried out for inverters too. 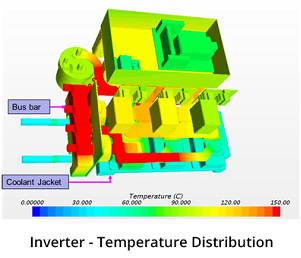 Thermal analysis of inverter is a key process that can assist engineers to focus on energy efficiency from concept phases on. Designing of inverter involves coolant flow path design, material selection, arrangement of bus bars and power modules. By employing conjugate hear transfer analysis on inverter, coolant flow path & fins design can be analysed and heat source (bus bars) to power module and heat sink (coolant jacket) path, will be designed based on temperature distribution. 3. 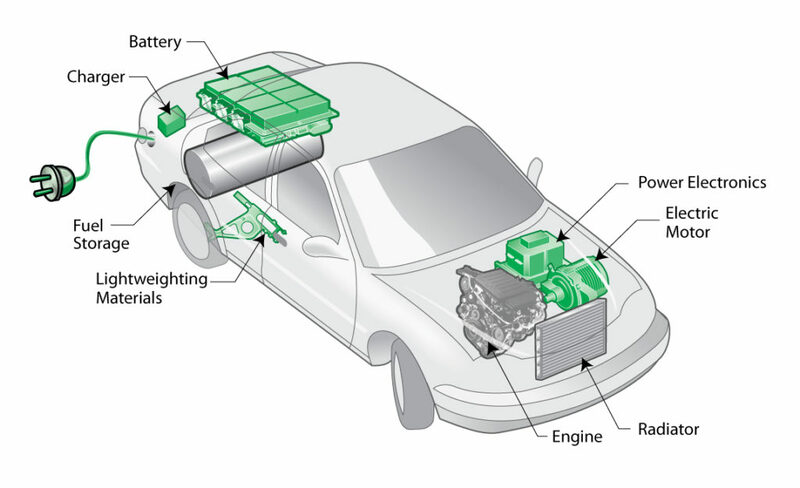 Battery Thermal Analysis – The performance and utility of clean energy mobility models like Hybrid Electric Vehicles (HEVs), Battery Electric Vehicles (BEVs) and Plug-In Hybrid Electric Vehicles (PHEVs) primarily dependent on the performance and efficiency of the battery package which acts as the powerhouse for the above means of transport. Considerable research is being carried out for identifying the best components that is more efficient in storing the energy as well as bound to react well in all the analysis & testing phases of a battery production process. Requirements and constraints for a battery changes according to application, irrespective of these changes a batteries performance and life span is always indicated by the temperature factor. Usage of battery always leads to heat generation and absorption. 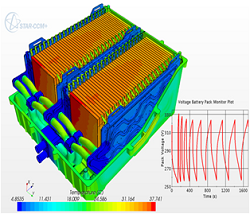 Therefore, the design and implementation of a successful thermal analysis phase is extremely important in battery manufacturing. With the precise set of outputs we can measure the impact of every aspects of the battery like raw material used, cell designs and the components that form the design on its performance & life cycle. 1. Durability and Fatigue Analysis – A key quality criteria for any product is its life expectancy. Fatigue and durability analysis is the test of time for structural parts that operates over and over, day after day. Mainly this analysis aims to explain how mechanical material behaviour relates to the design of structural machine components. Fatigue and durability analysis involves time, since failures are progressive in nature, local stress scenario because failures are prone to localization and finally the impact of working or fluctuating loads. Loads refer to any physical quantity that reflects the excitation or the behaviour of components that form a system over time. The most typical loads are forces, torques, stresses, strains, displacements, velocities, and accelerations, other sort of loads may be pressure or flow in hydraulic devices, rotational speed, temperature, or even state variable values in electronic control unit. Computer simulations determine how well parts will hold up during cyclic loading in stipulated time without much effort & energy. These calculations incorporate all data regarding materials, environmental conditions and specified constraints too. Results are important in calculating and verifying reliable operation of the machine within a given timespan. DEP’s capabilities for lifetime assessment ranges from basic tools with simplified loading assumptions to advanced applications that target specialized engineering-analysis tasks. The basic fatigue and durability analysis done by DEP design engineers can provide an elaborate stress analysis to avoid under- or over-designing of products by simulating actual loading conditions and useful when comparing designs or design options. Eventually the test result states the service life until damage is sustained. 2. NVH Analysis – Extensive modernization resulted in negative impact of sound and vibration on environment and all of us. Increased awareness towards noise and extensive knowledge about noise related health issues like hearing impairment, discomfort, stress and possibly trauma is driving the demand on keeping a safety valve over the sound source of all industry products. So product development is now having a new road block called noise and vibration analysis. Automotive industry is now characterizing automobile design not as engine and drive train but as vehicle-passenger expectation & experience. With those footnotes, a number of disciplines including the Noise, vibration, and harshness (NVH) attribute is given extra care in auto sector. Noise is unwanted sound; vibration is the oscillation that is always felt. Harshness is generally used to describe the severity and discomfort associated with the unwanted sound and/or vibration. An accurate NVH also called as sound quality analysis, which involves metrics such as loudness, sharpness, sound exposure level, and others experimental evaluation of vehicle noise and vibration is often necessary for undertaking a refinement process of vehicle quality in aspects of sound and satisfying the underlying development targets. Noise and vibration analysis needs a multi-disciplinary approach and a good understanding of mechanics, electronic measurement techniques, and sensor technology alongside signal analysis. DEP’s widespread knowledge and the proficient NVH testing team looks at the entire vehicle and reflects the numerical facts and figures on noise generated in terms of both air-borne and structure-borne grounds. With shorter lead times, DEP enables the manufacturers to gain a competitive advantage over other players.